An image is worth more than a thousand words. Interpreted, it makes sense. Geo-referenced images are stereoscopically plotted producing 3D lines that describe the terrain’s topography and features. We operate a complete digital production line, with over 90 qualified technicians using AU4 photogrammetric workstations that integrate tools for project management and quality control. CartoData has the installed capability to compile more than 3,000 km2 of urban mapping per year and a potential for fast response to accommodate even larger projects. An ortophoto is a rectified photograph, that may be used as backdrop in Geographic Information Systems (GIS). 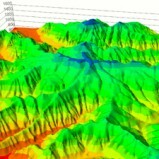 To generate ortophotos a digital terrain model DTM is required. The rectified images form a seamless mosaic.